When Michael Crichton passed in 2008, I was devastated. He was a pillar of my childhood, and the reason I loved reading science fiction. I understand that the old die-hards all grew up on Asimov, Bradbury, and Burroughs, but that wasn’t my era. For me it was the guy who wrote JURASSIC PARK and CONGO. I couldn’t get enough of his work. Two posthumous novels were announced shortly after his death, those being PIRATE LATITUDES and MICRO. I really liked the former and didn’t finish the latter, which was finished by a second author. I couldn’t really tell which parts were Crichton and which were the other, but it didn’t fire for me the way that the others had. What’s important to note though is that I read a lot of Crichton’s stuff when I was younger and far less picky about books. There are things I envy about my younger self and that is one of them. Nowadays if I get bored with a book I can’t force myself to finish it. Back then, I rarely got bored. So I don’t know now if such books as CONGO or SPHERE would hold my attention the way they did then. JURASSIC PARK and THE LOST WORLD certainly did, for their novelty, and despite not being connected to the franchise, DRAGON TEETH taps into that same vein of scientific adventurism. 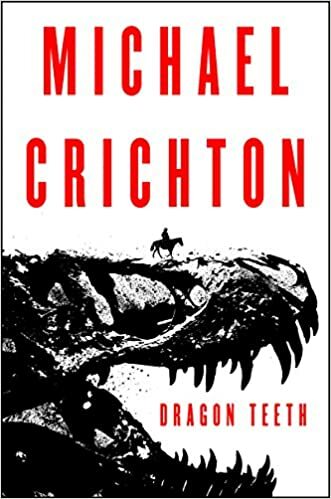 An afterword reveals that this book was found by Crichton’s late wife, Sherri, who prepared it for publication over the course of many years with the help of workers at Michael Crichton’s archives. So it is a posthumous publication, but the exciting bit of it is that it was one of his earlier novels, written in the 1970s, maybe a hundred years after the events of the book itself. Taking place in 1876, it follows the exploits of a young Yale student who, on a dare and a bet, goes west for the summer to dig up fossils with a crazy professor. The student, William Johnson (a fictional character) ends up caught between two warring paleontologists, Profs. Cope and Marsh, who were actual historical figures that battled each other over the course of a decade. That’s all I’ll say about the story, because the book itself is not that long. (The audio is under 8 hours. The print copy is 300 pages.) Frankly I think that is a strength of the story, that it flows and moves quickly and keeps up one’s interest. There’s no getting ahead of yourself, seeing what’s going to happen next but having to dig through fifty pages to get there. Check it out for a great summer read. Previous Post What “Pirates” needs if they’re reeeeeeeally determined to keep milking this cow.